Application Note - Industrial Gas Turbine (IGT) Archives - VISIONx, Inc. The system can be supplied with the same working envelope as your EDM drill. If you can drill it, we can check it! 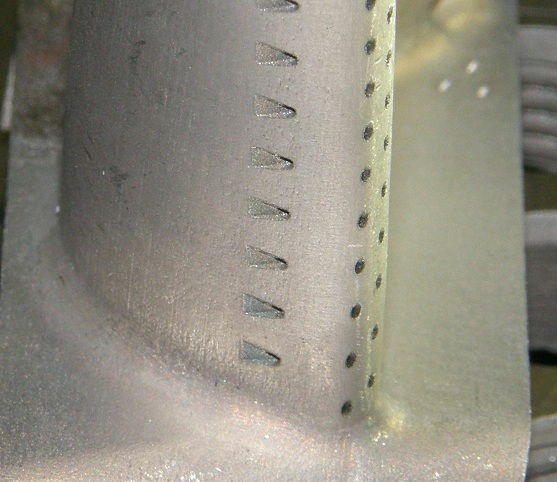 The ideal system for inspection and measurement of cooling holes on aircraft engine and IGT (Industrial Gas Turbine) components (blades, vanes, heat shields, shrouds, etc.). Parts can be either (ceramic) coated or uncoated. Supports Both Round & Shaped Holes, Anywhere on the Part! The 700-series VisionGauge® Digital Optical Comparator is a very cost-effective, perfectly adapted solution for the measurement and inspection of EDM-drilled holes. It is rapidly becoming the new standard in the industry!